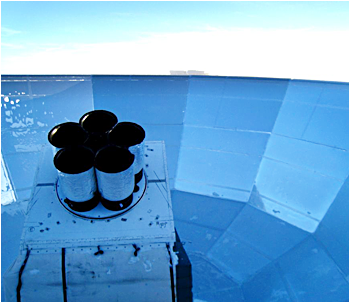 BICEP2, The Keck Array, and BICEP3 comprise a suite of experiments at the South Pole that are designed to measure the Cosmic Microwave Background (CMB) polarization at high precision to directly probe the epoch of inflation in the very early universe by measuring the unique polarization signature which would have been imprinted on the Cosmic Microwave Background by the inflationary Cosmic Gravitational-Wave Background. This so-called "B-mode" polarization pattern will be at level detectable if inflation is the result of GUT-scale physics. BICEP2, The Keck Array, and BICEP3 all use a similar observation strategy, integrating relentlessly on the 2% of the sky that is the cleanest of Galactic foregrounds from the South Pole, an exceptionally clear, dry, and stable millimeter-wave observation site. This suite of experiments utilizes cold, on-axis refracting optics for a compact design that minimizes systematics, and antenna-coupled Transition Edge Sensors (TES). BICEP2 observed from 2010-2012 with 512 detectors at 150 GHz, The Keck Array is currently observing with 2560 detectors at 150 and 100 GHz, and BICEP3 will begin observations in 2015 with 2560 detectors at 100 GHz. We are part of a multi-institution collaboration with 11 collaborating institutions. KICP Talk, Cafe Scientifique: Abby Vieregg, "Turning a Continent into a Telescope"